ONTARIO, Canada – The African Development Bank (AfDB) is a key institution that plays a critical role in the growth and development of Africa. The Government of Canada is a long-standing partner in delivering on shared objectives alongside the AfDB. 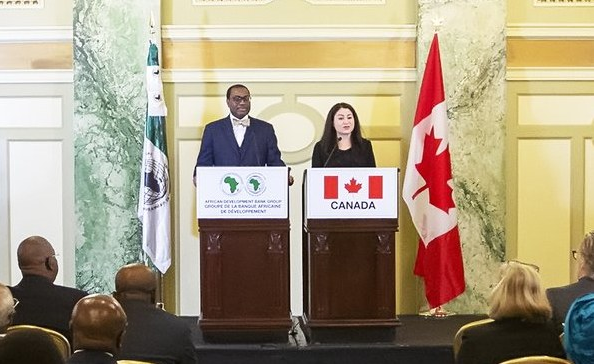 The Honourable Maryam Monsef, Minister of International Development and Minister for Women and Gender Equality, Friday, April 12 announced that Canada is willing to temporarily increase its subscription of callable capital at the African Development Bank by up to US$1.1 billion, if necessary, while the AfDB negotiates a permanent capital increase among all of its 80 member states. Minister Monsef made this announcement at the Spring Meetings of the International Monetary Fund and the World Bank Group. The temporary callable capital requested by the AfDB of its AAA-rated shareholders, such as Canada, will allow the AfDB to maintain its AAA credit rating and its support to client countries during the general capital increase negotiations. It would allow the AfDB to continue the important development work that is helping provide much-needed transport and energy infrastructure to the continent. Through its loans, the AfDB has supported clean energy and improved agricultural technologies, helped small businesses gain access to financial services, and helped provide many thousands of people with clean water, improved sanitation and quality education. Once the terms of the general capital increase are agreed upon by shareholders, Canada’s temporary callable capital would no longer be needed and would be withdrawn. African economies have, on the whole, grown significantly since the last capital increase at the African Development Bank almost 10 years ago. To sustain this growth—and empower women and girls as powerful agents of change, which will help Africa overcome its significant development challenges—continued access to finance and to the AfDB’s technical assistance is needed.